What do I need to know when considering PV? A maximum of 12 square metres of panels are permitted on your roof without planning permission. This is 7 panels. 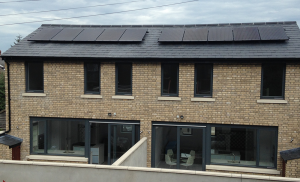 Panels placed on the ground outside do not require planning permission and can be used to help power your house. Up to 6kw (24) of panels can be installed on a single phase ground mounted system meaning in some cases you could almost offset your annual electricity bill. Entry level Package: PV panels on your roof generate electricity and feed it into your fuseboard with a standard inverter. If the house is calling for power this free electricity will be used instead of using KW from the ESB. With this system you must use it or lose it. Water diverter option: Excess energy can be used to heat a solar water immersion. 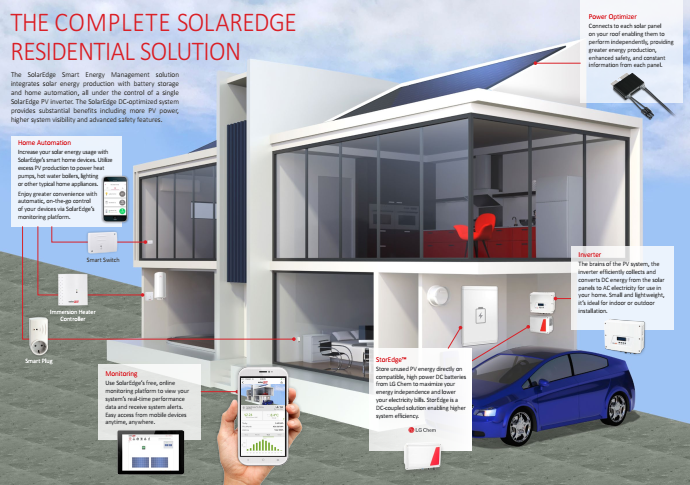 Optimisers and smart inverters option: By using power optimisers which are connected to each PV panel and a Solar edge inverter the output of each panel is optimised. This design brings multiple benefits including panel level online monitoring, superior safety features and the option to upgrade to battery storage. Battery storage option: Excess PV energy can be put into a 3,6 or 10KW LG battery during the day to be drawn down later that night. One can also charge up your battery at night time with cheaper night rate electricity and use it during the day. Home Automation option: Excess PV energy can be used to help power heat pumps lighting or other home appliances. With this option you can see what energy you are consuming from the ESB, what energy you are producing from your PV system over any time period in real time.